I was on vacation Friday night, June 22, but weather never stops or sleeps. I worked the severe thunderstorm event that night on social media; Charles Daniel did a wonderful job on ABC 33/40 over on the TV side in my absence. And, there were frequent updates right here on the blog as always. Without having to deal with TV coverage (which for me, is very rare), I made some interesting observations about the warning process, and felt the need to write this post. We can all learn from the event. It was highlighted on TV, the blog, and social media…. letting people know that organized severe storms were going to be possible later in the day into the evening hours. But the main threat highlighted was damaging straight line winds. 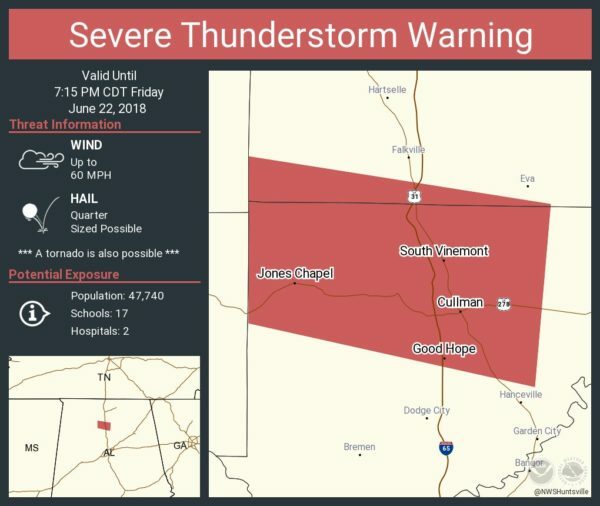 THE WARNINGS: A severe thunderstorm warning was issued for Northwest Cullman County at 6:40p CT… this was 15-20 minutes before the damage occurred. 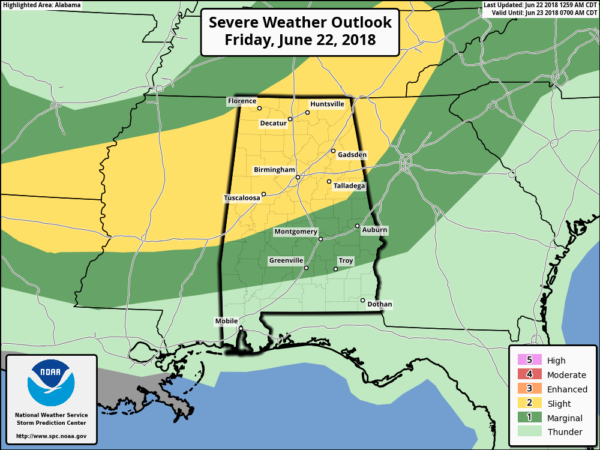 THE EVENT: A tornado, rated EF-2 moved through far Northeast Winston, and Northwest Cullman Counties; some of the most severe damage was to a mobile home along Cullman County Road 1114 near between Jones Chapel and West Point, where three people were injured (a mom, her 7 week old infant, and her 14 year old daughter). 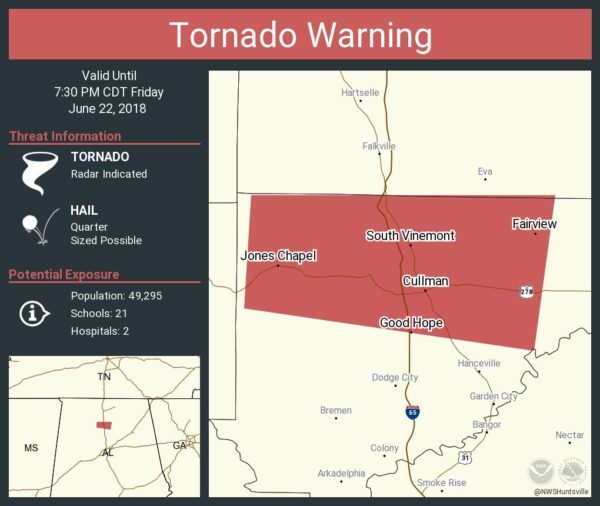 The tornado first touched down at 6:50p in far Northeast Winston County, and dissipated at 7:12p CT in Northwest Cullman County. *Some of the tornado damage happened while the severe thunderstorm warning was in effect (a 10 minute lead time); the tornado warning was issued as the radar signature improved and damage/spotter reports were coming in. For some along the eastern part of the track, the tornado warning was issued about 5 minutes before the damage occurred. (issued at 7:07; the tornado ended at 7:12). *There are things we can do in operational meteorology, and some things we can’t do. Warning for smaller, short lived tornadoes like this is a great example of something we are not able to do well. For the strong/violent tornadoes (EF-3 to EF-5), you will get a warning almost every time with as much as 30-40 minutes lead time. For an EF-0 to EF-2 tornado that is down for only a matter of minutes, sometimes there is no warning, and even when a warning is issued it can be too late. It is simply a limitation of the science now. Pay close attention to what is going on during severe thunderstorm warnings. *Not being on television, I could focus on comments on social media last night. Unfortunately we still have a siren dependency issue in Alabama. The “siren mentality” has killed countless numbers of people in our state over my 40 year career. If you are using an outdoor siren as your main source of receiving a tornado warning, you won’t have much hope. 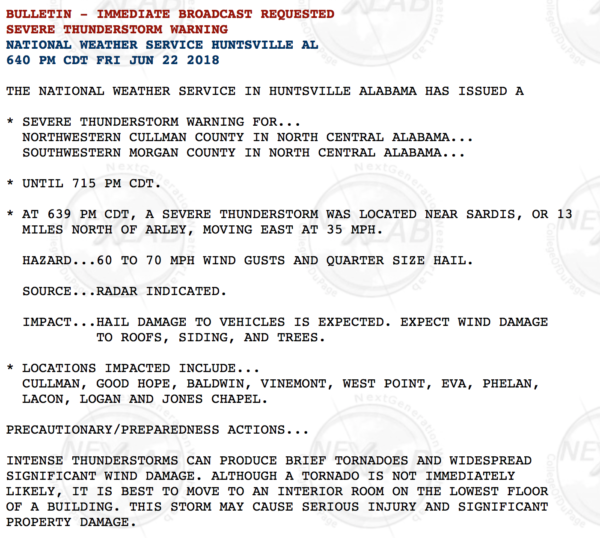 Every Alabama home needs a NOAA Weather Radio, and everyone with a smart phone needs a good app designed for pushing warnings. Most know my favorite for this specific purpose is WeatherRadio by WDT…. but the ABC 33/40 weather app (free) does good job as well. iOS version here… Android version here. Yes, I know there are some that can’t afford the 30 dollar NOAA Weather Radio, and there are some that don’t have smart phones. Sirens are a last resort for those people and others that are outdoors with poor radio coverage. But never make them your primary way of getting a warning. *I am actually not a big fan of trying to issue warnings for every short lived, small tornado. We are just not that good, and it is like playing whack-a-mole since they usually last only for a few minutes, and we will wind up with countless warnings that are false alarms. 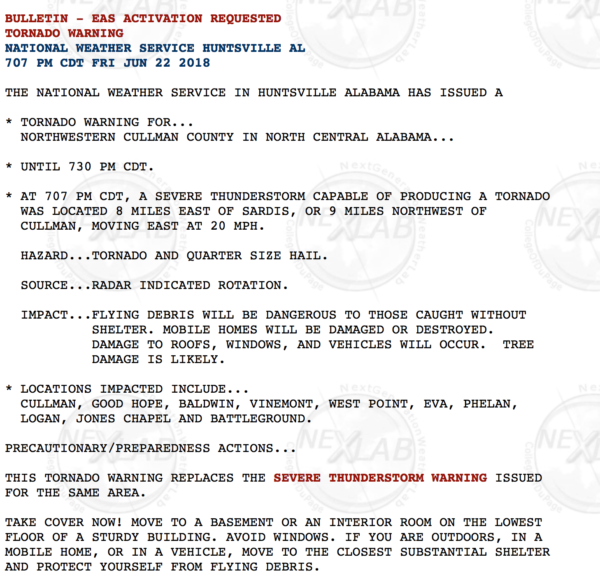 That leads to the “cry wolf” syndrome and people won’t do anything when warnings are issued for the strong/violent tornadoes that cause most of the deaths in Alabama. We just have to be sure people listen closely to severe thunderstorm warnings. And we have to be better communicators. *A mobile home is not safe during a tornado. A recent video has been circulating around Facebook from a retired Alabama EMA employee (now working for a mobile home manufacturing association) with the broad suggestion that staying in a manufactured home is an option during a tornado. Not true. I am actually a big fan of manufactured housing; it offers really good, affordable home choices for many Alabamians. But, you cannot stay in one during a tornado, period. 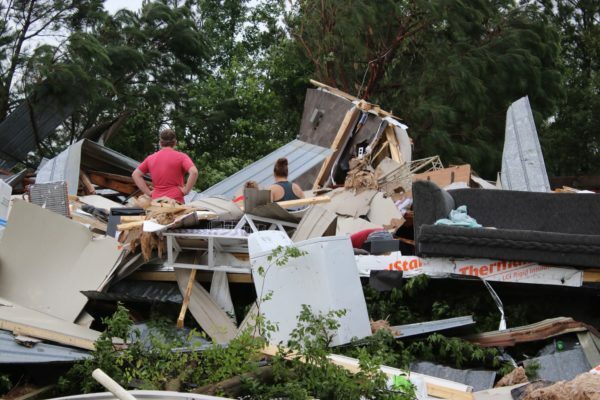 The family that lost their home in Cullman didn’t know to leave since there was no tornado warning at the time; they are very fortunate to be alive. *The photos and video sent to me are invaluable during events like this. I received over 300 pictures and videos of the severe storms moving across North Alabama during this time frame. We have a very extensive SKYCAM network at ABC 33/40, but we still don’t have cameras everywhere. You are our eyes, and our window to the world when this kind of thing happens. Thanks to all who sent material to me last night. The images came mostly across Facebook, Instagram, and Twitter. Some via Snapchat and email. *If you would like to help the family that lost them home near West Point last night, this page has been set up as a way of doing just that. 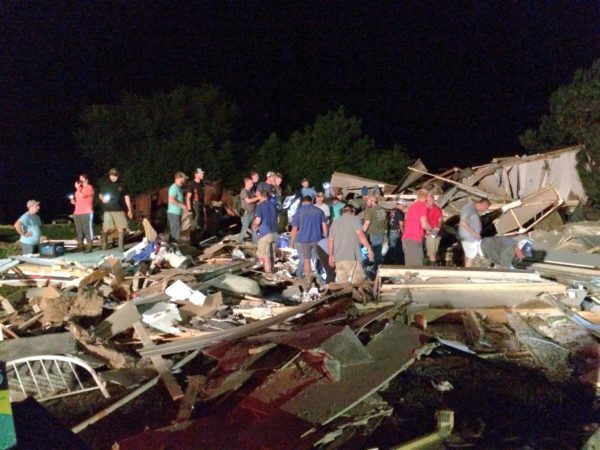 Nobody expected an EF-2 tornado going into the event, but it did happen. In the words of one of my mentors, the late Al Moller, “when it comes to thunderstorms, expect the unexpected”… June 22, 2018 was another great example.